In addition to wipes and cloths,TIDDOX® also supplies a wide range of environmentally friendly, metal detected bags of rags suitable for industries including: Printers, Painters, Automotive, Industrial, Manufacturing, Mining, Marine and others. The textiles are washed and recycled, and then screened through a metal detector to ensure any metal, such as zips and buttons, is removed. TIDDOX is an importer wholesaler of used textile cleaning materials, such as COLOURED T-SHIRT RAGS and WHITE T-SHIRT RAGS . 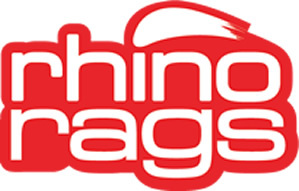 TIDDOX's RHINO BAGS are environmentally friendly, meaning that they are recycled from unwanted clothing that has been washed and cut to size, such as t-shirts, linen, fleece, tracksuits, dresses, cotton shirts etc. Once the selection process and washing process is completed, they are screened and metal detected to ensure unwanted metals such as zippers and buttons have been removed prior to packaging, ensuring that the contents of the bag are safe to use by the customer and will not contain objects that may injure or scratch surfaces. Packaging is available in either 10kg, 5kg or 1.5kg bags. Recycled textiles are a great general purpose wiping cloth that is very cost effective, absorbent and low linting. Printers Rags, comprising white t-shirt rags as they are ideal with solvents, clearly show up ink and do not run dye from the T-shirt. They are also very absorbent and low linting, which are key attributes of any printers cleaning cloth. Painters Rags, made up of white cotton so no dyes run into the paint job. These reclaimed textiles can be used with solvents and are available in most paint shops. TIDDOX supplies painters nationwide with convenient and portable 1.5kg bags of white cotton, as well as 10kg and 5kg bags. Industrial Rags, mostly mixed cotton fleecy, which is a cost effective solution for wiping of oil and grease, chemical floor spills, cleaning of tools and hands, and other cleanups that need industrial-grade cleaning materials. Manufacturing, made up mainly of coloured cotton fabrics and coloured t-shirt rags for cleaning machinery and equipment, and other general purpose factory wiping requirements. Mining, typically supplied in bulk bales for high volume usage in mining areas. Marine, which typically are white t-shirt rags (cotton) as these are a lighter, absorbent wiping material. Unwanted textile clothing materials that is SOFT and ABSORBENT, WASHED and RECYCLED (USED) has long been a favourite general purpose cleaning rag in automotive, industrial and marine workshops. Being SOFT means that these knitted cottons are non-abrasive and will not scratch surfaces or the user with discarded pins, buttons or remnant metal objects such as zips. Running the textiles thoroughly through a metal detecting machine also ensures that such foreign objects are removed from the materials prior to packaging. Only selecting used WASHED fabrics ensures that the material is ABSORBENT. New unwashed textiles are not nearly as absorbent as used washed textiles. By using RECYCLED (USED) textile clothing that has been reclaimed, washed and reused is environmentally responsible and saves this discarded clothing from unnecessarily heading into land refills. It is also lowers the cost of the product. MIXED COLOURED T-SHIRT (recycled coloured singlets which are soft and very absorbent). These are the most popular, economical type of workshop rag. A low linting material with high absorbency characteristics. WHITE T-SHIRT (white recycled singlets). For tasks where a colourless rag is required, such as when solvents are used. These cotton blended recycled T-Shirt materials are very absorbent and ideal for polishing tasks. MIXED COTTON (reclaimed soft cotton fabrics, such as polo shirts and windcheater). A high volume budget rag, known as FLEECY. This rag is made up of a mix of medium and light coloured cotton recycled materials. All of the above are cut from metal detected soft knit materials that are highly absorbent. So please contact a TIDDOX warehouse in your state and ask us to deliver to you your preferred bags of rags, be it white t-shirt rags, coloured t-shirt rags, mixed cotton, white cotton, fleecy or flannel.